Steven Spielberg is a bit like Hitchcock in this respect: even his lesser films feature something worthwhile. This would be one of those. 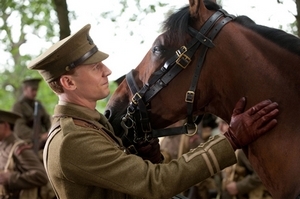 War Horse follows the exploits of the titular nag, from his inauspicious beginnings in Devon where Ted Narracott (Peter Mullan) buys him at auction. His wife (Emily Watson) is furious, since they needed a plough horse, not a thoroughbred, but his son Albert (Jeremy Irvine) is overjoyed and names him Joey. When the first World War comes knocking, the horse is sold to the army in order to pay off Ted’s debts, and so begins a journey through Europe and across battlelines as the steed moves from owner to owner. It’s basically a series of short films, as we see the war from all sides as Joey passes (or is passed) from one person to another. Naturally, some of these characters are more interesting than others. After an exceedingly slow beginning featuring John Williams beating us around the head with his intrusive scoring, the film picks up once we enter the war. There are several startling sequences that really prove Spielberg hasn’t lost his touch. Whilst the slower, character-driven moments can be awkward – like everyone is posing for the camera – the action is masterfully orchestrated. It must be said that there is some incredible wrangling going on here. As far as I could tell, a CGI horse features very rarely, and the rest of the time we’re seeing what I assume are multiple well-trained horses performing as Joey. It’s sometimes funny to watch the film try to give the horse’s expression significance (after all, they’re not the most emotive of animals), but on the whole it works. The production values are generally impressive, aside from a particular scene which features not day-for-night, but day-for-sunset. I can’t remember ever seeing this before, but Spielberg, Kaminski – whoever – decided it would be a good idea to simply slap an orange filter over the image, so as to make it look like sunset. The result looks awful (and awfully unrealistic) and really ruins the tone of the scene. The performances range from the brilliant to the so-so. Strangely enough, Watson appears uncomfortable here, which is something I’ve never seen from the actress before. Again, it comes back to the fact that in the slower moments, the blocking of the actors and the construction of the shots seemed more important than the performances. Irvine is overly earnest most of the time, and to be honest I got a little frustrated by his constant pleading through the film. Tom Hiddleston has a standout role as Captain Nicholls, one of Joey’s owners, whilst Niels Arestrup manages to bring some authenticity to a role that could have easily been overly cheesy. And cheese is indeed the order of the day, as Spielberg serves up a huge platter of schmalz with War Horse. At 146 minutes, the film is too long, yet strangely lightweight. It doesn’t take us anywhere new, and compared to Saving Private Ryan and Empire of the Sun, this is probably the worst of his war films. As I said at the beginning, there is still evidence of a master filmmaker at work here, it’s just that the film’s so darn earnest that it’s a struggle to truly be immersed in the narrative. This entry was posted in Film Reviews and tagged Drama, Period Drama, War by Stuart Wilson. Bookmark the permalink.